When we were at San Diego Comic Con this past summer, one of the most talked about movies was Blade Runner 2049. After decades of waiting, we finally are getting a sequel to one of the most iconic science fiction movies of all time, Blade Runner. Of course that meant a recipe and with a little inspiration from the walk through at SDCC, we came up with our version of Spirited Noodles! Blade Runner 2049 is set thirty years after the events of the first film. A new blade runner, LAPD Officer K (Ryan Gosling), unearths a long-buried secret that has the potential to plunge what’s left of society into chaos. K’s discovery leads him on a quest to find Rick Deckard (Harrison Ford), a former LAPD blade runner who has been missing for 30 years. 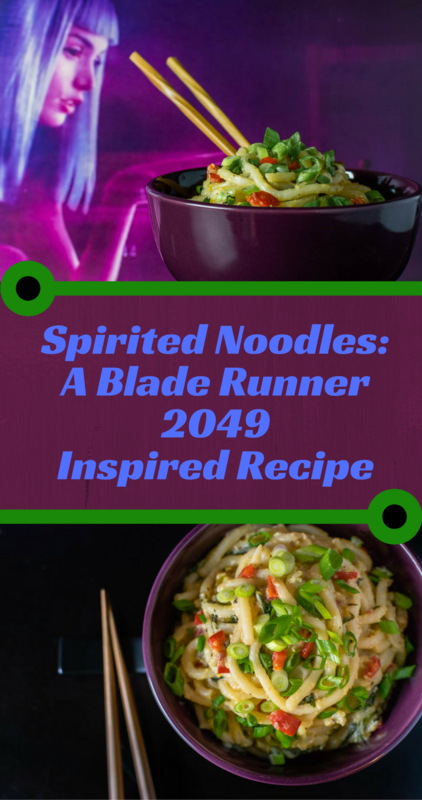 The inspiration for our recipe came from a dish we were served at San Diego Comic Con within the Blade Runner 2049 Experience. Without knowing the exact ratios or ingredients used, we went off of the description and modified it to our taste. Additionally, with Johnnie Walker being a sponsor at the event and within the movie, we had to use it in our sauce! Here is where things get a little different! 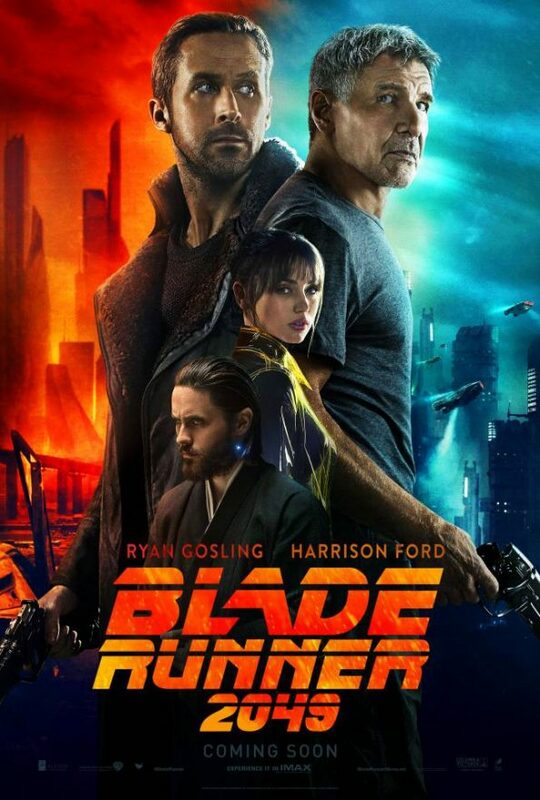 Normally we giveaway screening tickets for movies, however, this time we are giving away 10 pairs of Fandango Passes which means you can see BLADE RUNNER 2049, anywhere in the U.S., at any time, until Thursday, November 2nd, with one guest, up to $12 a person! The winner will be chosen on Tuesday, October 3rd, so you’ll need to enter quickly! Good luck! Prepare noodles per package instructions. Set aside. Combine stir fry sauce, Johnnie Walker, and soy sauce in a bowl. Stir and set aside. Spray a large pan (or wok) with cooking spray and heat over medium-high heat. Add bok choy and red bell pepper to pan and cook until they are almost fork tender. Add noodles and sauce. Stir to combine. Cook for about 3-4 minutes and then push noodles to the side of the pan. Whisk eggs in a bowl and then pour into the noodle pan. Once eggs are partially set, mix noodles into the eggs. Stir to combine and cook until egg is finished cooking. Serve with green onion garnish. Oooh! Interesting sauce! Sounds perfectly delicious and maybe has a little kick? I love noodle bowls like this. Yum. Mmmmm, this recipe sounds fabulous! 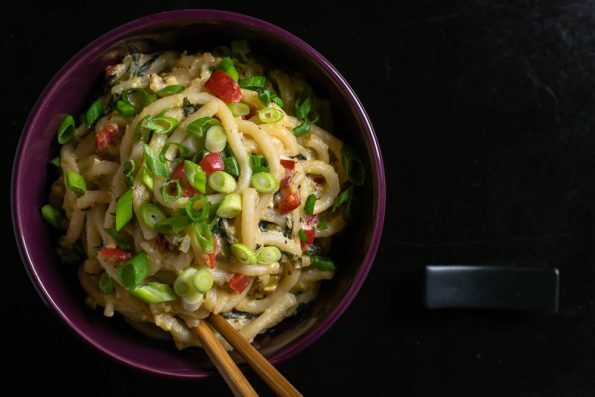 We love udon noodles in our house… and spirited ones? Gotta try those! How fun is this! I went to see Blade Runner 2049 Thursday night and it was amazing! 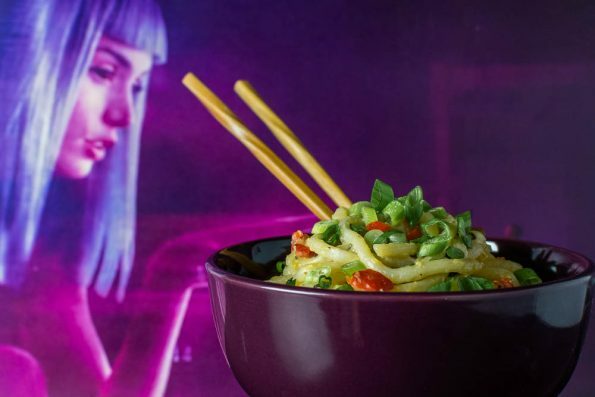 This noodle recipe would be perfect to enjoy after seeing the film. Im so in mood for noodles lately! Still haven’t seen Blade Runner but it’s on the bucket list! I bet the sauce gives the noodle a very interesting flavor! This looks like a wonderful bowl of noodles! I love the addition of Johnny Walker! So cool and this looks totally delicious. I’ll have to try this soon. Blade Runner sounds like a cool movie to watch. Your delicious sounding noodles contain all my favorite ingredients and I love the addition of Johnnie Walker. I’m going to try it next time I make noodles. Never tried udon noodles. Looks like a fun recipe to try. Thanks for sharing. I’m on the fence about this movie, a lot of reboot’s haven’t been delivering, but after a few of these amazing drinks I’ll be game to see it! Nice! I loved the movie (also a fan of the original, obviously) and I already feel inclined to try, since it’s very different from what I usually make. Thanks!